Yesterday, a friend posted in a Facebook group the dreaded “OMG” post. If you have a back up of your blog, it’s easier to get back into the swing of things if something horrible happens, like your account gets hacked! Don’t think it can’t happen to you! Sh, erm, stuff happens. Knowing you have a back up of your blog will take a little bit of the headache away. How Often Should I Be Backing Up My Blog? It is recommended that you back up your blog weekly! If you post daily and want an up to date record of your blog than you should be backing up daily. DAILY! So “how does one back up their blog?” you ask. I am going to be honest. I never backed up my blog when I was on blogger. Why? I just didn’t know how! And now that I do know how, I could kick myself for not doing it then! It’s so easy. You just have to export your blog! To export your blog, go to the Settings | Other tab. All you have to do is click “Export Blog”. Then, click the Export Blog button. Your blog will be stored as a Blogger export file (.xml) which can be kept as a back up on your hard drive or imported into another blog. Exported blogs are not deleted from your dashboard or from Blogger.com. Of course, there’s a Plugin for that! Install the free BackUpWordpress plugin. Once you have it installed, you need to edit the settings. You can have the back up emailed to you and have a copy stored on your server. Having it in two places is a good idea in case something happens to your either your computer or your server. You can also set backups to run automatically or you can do them manually. 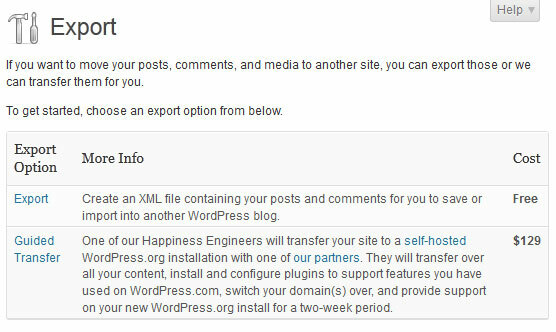 If you have a WordPress.com blog, you can use the export feature to save a copy of your content. Let this be your daily reminder to back up those blogs! I just started doing this a month or two ago! Thanks for the reminder – I want to go check my settings. I have wordpress and do it manually, but now that I see there is a plugin, I am going to get that! thanks! Backing up your blog is one of those ‘not so fun’ tasks that I always forget to do– thanks for the reminder, I’ll do it right now! One of my blogs I can backup with a plugin. There’s something funky on the main one that prevents me from using the plugin. I did it thru ftp though I’m not sure I got all the needed files. Wow, I am so glad I saw this post before I had any problems! I’ve finally gotten good about backing up my computer, but for some reason I had never thought about my website. Thanks for the helpful how-to! I never ever thought to do this…I’ve had that Blogger message before but luckily it was an error on their end! I back up on my server, but now I am going to install the plug-in! Thanks for writing this! I do not back up my blog, I subscribed to it so all the posts go to an email account just for that purpose. I am going to go back up everything now before the problems arise! Oh wow! Things like this make my heart stop. And then I would freak out. Thank you so much for this, I am a fairly new blogger and need all the help I can get.